Robert Goad was inducted into the Army in July of 1944 in Huntington West Virginia. Less than 6 months later he was on his way to the Pacific Theater and assigned to the 171st QM Laundry Det. After the war, Robert worked for a short time at Cooks Cleaning Convenience Laundry in Radford VA moving on to the Radford Army Ammunition Plant and remained there for 32 ½ years. Laundry units, which carried and operated their essential equipment, such as washers, tumblers, and water heaters, on heavy trailers, supposedly furnished the services required by hospitals and by individuals in the field. In the Pacific they actually did this for hospitals, which had priority, but there were too few of them to do much work for individual soldiers. The number of pieces handled for troops, though greatly exceeding that handled for hospitals, nevertheless represented only a small percentage of the total number in need of cleaning. If the ordinary unit of two trailers worked sixteen hours a day, seven days a week, each trailer still served only 3,000 soldiers a week at the normal rate of about twenty-five pieces a man. In many places, moreover, no trailers were available. Even if they were, the difficulty of hauling them over rough terrain often prevented their location at sites that permitted maximum service. It is not strange therefore that in most parts of the Pacific laundries accepted individual wash only at the low weekly rate of six to eight pieces a man. The New Guinea bases were much worse off. Here there were no laundry units at all until well into 1943. 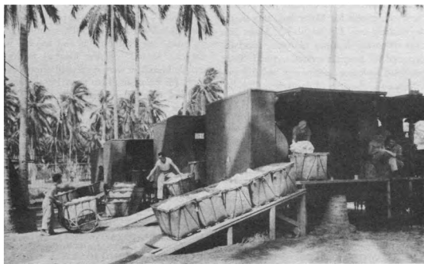 At the end of June 1944 the platoons of three recently arrived companies were divided between the bases and the Sixth Army, but their manpower and equipment were so inadequate that even at the bases, except for Milne Bay, they could do washing only for hospitals. 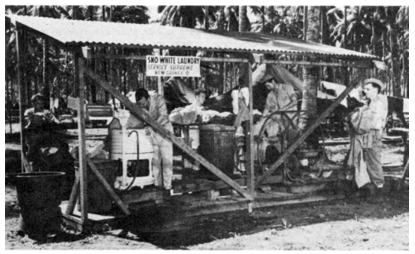 LAUNDRY FACILITIES IN THE SOUTHWEST PACIFIC were a problem only partially solved by unit equipment (above) and Quartermaster laundry trailers (below).